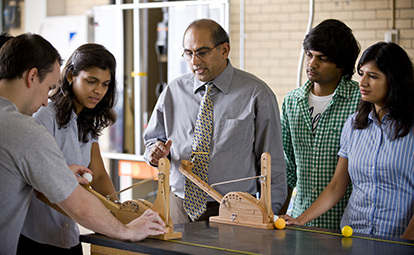 The engineering science track will link your interests in physics and math with your excitement for engineering. Your classes, lab work and field work opportunities will focus on the use of electronics and advanced engineering programs. You'll complete coursework in topics such as optics, electromagnetic fields, digital electronic measurements and thermodynamics. You'll find opportunities to work for and collaborate with faculty on nationally recognized research. You'll also have access to the latest equipment in a range of modern physics and engineering laboratories. Research labs in optics, materials, observational astronomy and computational physics. Modern optics lab allows computer-assisted optical design work and laser and fiber optic experimentation. Faculty research programs in theoretical nuclear physics, theoretical quantum mechanics, laser spectroscopy, materials development and testing, planetary science, extragalactic astronomy and stellar astronomy. State-of-the-art lasers available for spectroscopy. New optics and advanced optics laboratories in the new, 100,000-square-foot Integrated Science and Engineering Laboratory Facility (ISELF). NASA is sending a device designed by physics professor John Harlander into orbit as part of a 2017 Explorer satellite mission. A full-sized planetarium in remodeled Robert H. Wick Science building. Rooftop observatory with 6-, 8- and 11-inch telescopes and attachments for viewing solar flares and sunspots, photometric studies and astrophotography.